In the interview, [Eric] Priebke proved he remained an arrogant Nazi monster until his dieing day. He claimed Jews are partially to blame for the Holocaust, which extent he however denied. He reveals himself as an unreconstructed anti-Semite who continued to peddle the lies that stoked the genocide of six million Jews, among them 1.5 million children, as well as millions of Russians, Poles, gypsies and gays. “In Germany Jews’ behaviour was openly criticised since the early years 1900s. They had amassed a huge economic and political power, despite being a scanty part of the world population. This was perceived as unjust. “It is a fact that even today if you take the 1,000 most powerful and rich individuals in the world, most are Jews,” Priebke said..
“They stockpiled huge capital while most of Germans were living in poverty. Moneylenders got richer and annoyance towards Jews grew higher,” Priebke says. So, what was the heinous war crime committed by Priebke? Why was he hunted down in Argentina and brought back to Germany for trial? During WWII [Priebke] served under the command of Herbert Kappler in Rome. On 23 March 1944 Keppler ordered the execution of 335 Italians, in retaliation for an attack by partisan troops that had killed 33 German soldiers. The execution by firing squad was carried out under captain Priebke’s supervision in the ancient Ardeatine Caves in central Rome. At his trial Priebke claimed he had only ticked off the names of those killed from a list that included 12 underage boys, about 80 Jews and a catholic priest. Under the rules of the Geneva Convention of 1929, POWs, who had been captured while fighting on the battlefield, were protected from reprisals. However, it was not until the Geneva Convention of 1949 that civilians were also protected against reprisals. The Geneva Convention of 1949 states that the principle of the prohibition of reprisals against persons has now become part of international law in respect to all persons, whether they are members of the armed forces or civilians. According to international law during World War II, under the Geneva Convention of 1929, it was legal to violate the laws of war by responding with a reprisal against civilians in order to stop partisan actions that were against international law. The fact that “underage boys” as well as Jews and a Catholic priest were killed in the reprisal where Priebke “ticked off the names,” indicates that this was a legal action taken against civilians as revenge against the civilians for killing German soldiers. Priebke was guilty of being a “war criminal” only because the Allies changed the laws AFTER World War II. Would it have killed the reporter for the International Business Times to have explained all this? In today’s news, only one side of the story is told. Recently I saw the movie “Massacre in Rome” in which Richard Burton played Kappler, who was involved in the Adreatine Massacre. This was the first I had heard of this story. As usual the mere fact that Burton was involved made this a movie worth watching. But overall it was a great movie. One thing I learned was that the Hague Convention allowed reprisals against civilian hostages. Also I found out that the American Army field manual in WW2 allowed reprisals against civilians, including executions, although I don’t know if any hostages were actually executed. I never knew reprisals were legal. This shows how barbaric people still were even in the middle of the 20th century. I do not approve of Hitler or the Nazis, but I think most German soldiers, including many in the SS, were basically decent men. I think the Allies got away with numerous war crimes, while executing German soldiers for similar crimes. Hopefully in the future everyone can follow international law, and those who break the law and violate human rights will be punished. Of course Zionists must follow the same laws as everyone else. As for Jews in the ADL, they should stop whining. People are getting really sick and tired of how they are going after senile old men who already have one foot in their grave. The Jews should focus instead on cleaning up their own dirty act in finance, the media, and of course in the Jewish State. That’s right, don’t forget the eternal victim. What a deceitful title! Priebke never blamed the Jews for “the Holocaust”…because he never believed in “the Holocaust”. He blamed the Jews for the persecutions brought on them by their own behavior, but with no gas chambers (as Priebke believed) naming those persecutions a holocaust is ridiculous. So the title “The Jews were to blame for the Nazi persecutions” would be more correct and honest and it would reflect Priebke’s real opinion.. He (Priebke) claims the gassing of millions Jews is false and that existence of gas chambers was cooked up at the Nuremberg trails of Hitler’s top Nazi henchmen. He describes Nuremberg as a “show trial” and a farce set up to dehumanise Germans and cover up war crimes made by the US and its allies. “The activity carried out by a gas chamber is invasive towards the environment and terribly dangerous, deadly, also on the outside. “To kill millions of people this way, in the same place where other work and live, without them to notice anything is absurd,” he rambled. 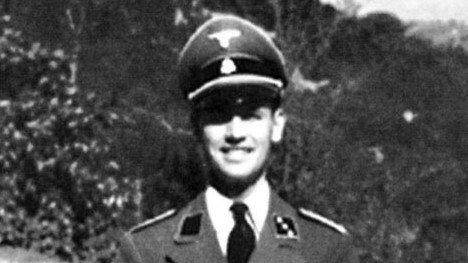 Priebke claimed he was “dismayed” when he first heard about gas chambers after the end of the war. He said the world was “brainwashed” by US propaganda to believe that Germans were evil, so that the allies could get away with the indiscriminate bombings of German cities and rule the world undisturbed according to their economic and political interests. Strange way to blame the Jews for “the Holocaust”, isn’t it? Yes, he died a few hours ago,(NZ-Time) at the age of 100 in Rome, and was more or less a ‘free man’ during the post-war period, living for about 50 years in Argentina until a TV-crew tracked him down. Are you a famous person? Your name sounds like the name of a famous person. Heinz Bartesch is the son of Martin Bartesch. I knew that I remembered that name, but I couldn’t recall where I first learned the name. I should have searched my blog instead of searching Wikipedia.